BEIJING—A Chinese court has jailed a son of an exiled Muslim dissident for seven years for tax evasion in what one critic said was retaliation for her work in championing the rights of fellow Muslims. Alimu Ahbudurimu was convicted of evading taxes worth 208,430 yuan ($26,000), Xinhua news agency said, adding that brother Kahaer Ahbudurimu was also found guilty of evading nearly 2.5 million yuan of taxes but spared a jail term. The two are sons of Rebiya Kadeer, an ethnic Uighur who was jailed for five years in China for providing state secrets to foreigners before she was sent into exile in the United States last year. She was nominated for the Nobel Peace Prize this year. “It's clear retribution for Rebiya Kadeer's advocacy on behalf of Uighurs,” Nicholas Bequelin, a China researcher in Hong Kong for the New York-based Human Rights Watch, told Reuters. The Chinese Foreign Ministry and the cabinet spokesman's office had no immediate comment. Rebiya could not be reached. The charge against Alimu related to when he was the legal representative of Ahkeda Trading Company in Urumqi, capital of the restive northwestern region of Xinjiang, between 2002 and 2004, Xinhua quoted sources with the People's Court in the Tianshan District of Urumqi as saying. Kahaer evaded taxes while operating the Rebiya Building on behalf of Alimu between 2000 and 2004, Xinhua said. The court ordered Alimu to pay 500,000 yuan in fines and Kahaer to pay 100,000 yuan, it added. Kadeer's assets were worth 270 million yuan ($33.8 million) at the time of her arrest but she told Reuters in September that her trading firm and other businesses in real estate are now almost bankrupt due to official harassment. Kadeer, a mother of 11, also said two of her sons were beaten up by Chinese police when they were detained in June. The whereabouts of a third son who faces subversion charges are unknown and a daughter has been put under house arrest. 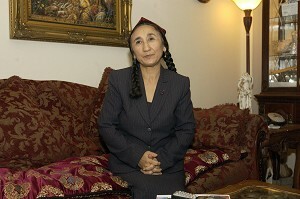 “There has been a long history of harassment and persecution of the family by the Xinjiang authorities,” Bequelin said. Kadeer, president of the Uighur American Association, has pledged to champion the rights of Uighur women and children, lamenting that many girls ended up working as prostitutes in Chinese cities and boys became thieves or pickpockets. Kadeer was once a member of the top advisory body to China's parliament but fell from grace and was arrested in 1999 while on her way to meet U.S. congressmen visiting Xinjiang. China keeps a tight grip on oil-rich Xinjiang, which shares borders with three former Soviet Central Asian republics, Afghanistan, Pakistan, Russia and Mongolia. China calls Uighur militants terrorists and blames them for a string of bombings and assassinations in the 1990s. But human rights groups say China has used its support for the U.S.-led war on terrorism to justify a crackdown on Uighurs, including arbitrary arrests and use of the death penalty.